Kids These Days: Unruly Goats Graze Hell Across Suburban Boise More than 100 professional ungulates overran an Idaho neighborhood Friday, briefly tasting freedom — and a whole lot of manicured lawns while they were at it. Disclaimer: These are not the goats that went on the lam in Boise. But they sure look just as sassy. But first came a half-hour of harrowing quiet from his account, as onlookers wondered whence came all the amazing grazers. 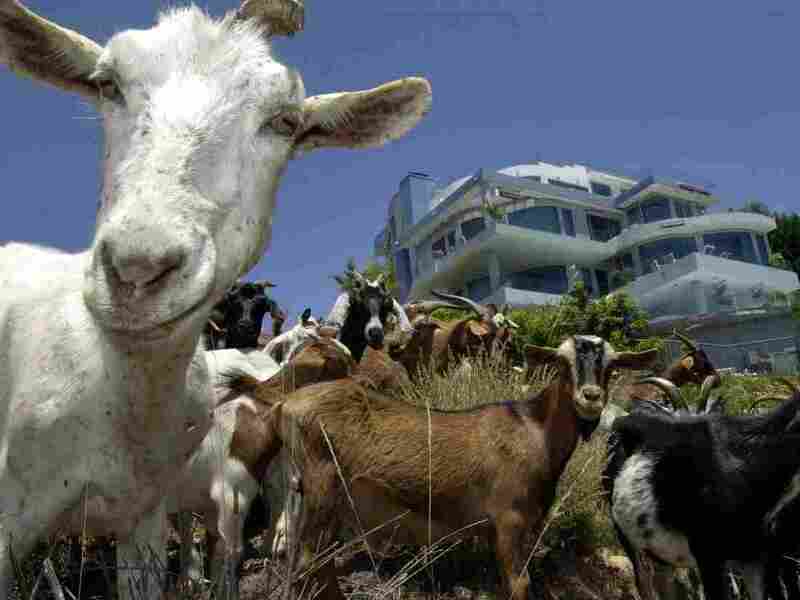 What could be happening to those innocent lawns — and what motive drove so many goats to go on the lam? As the reporter resumed tweeting, posting some truly moving images of the goats making hay, the world grasped at straws. It may be the apocalypse, one commenter posited, presuming the dreaded horsemen got their ungulates confused. Or it could be a plague of the petting zoo variety. Given the distance, at least it was unlikely they hailed from Bahrain. Ultimately, the reality was more down to earth. Soon Parris and his television station, KTVB, solved the great hircine mystery, reporting that the goats were rogue lawn mowers. We're not kidding; that's a thing. They had been rented to chow down on the lawn on a nearby retention pond when they broke free, tasting freedom — as well as a large quantity of grass, bushes and once-manicured gardens that weren't part of their assignment. Even Animal Control officers couldn't rein in all those unruly kids. But eventually their rampage ended. The company responsible for them — named We Rent Goats, naturally — managed to get its goats wrangled and rounded up into trucks. All of which leaves us with a few good truths to chew on. For one, if you're renting goats to trim your lawn, it would behoove you to keep them under close observation. And here's another: As far as lawn mowing stories go, this may be the greatest of all time.